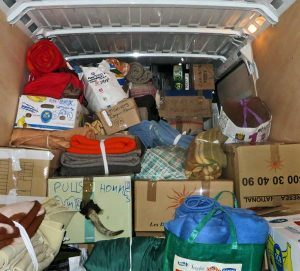 Finally we are on our way in our long, 14m.cu hired van, filled with dozens of big boxes of warm clothes, sleeping bags, food – 1/2 a tonne! 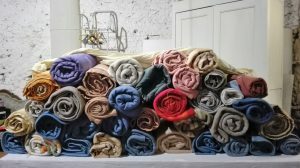 – shoes, tents & personal hygiene items. 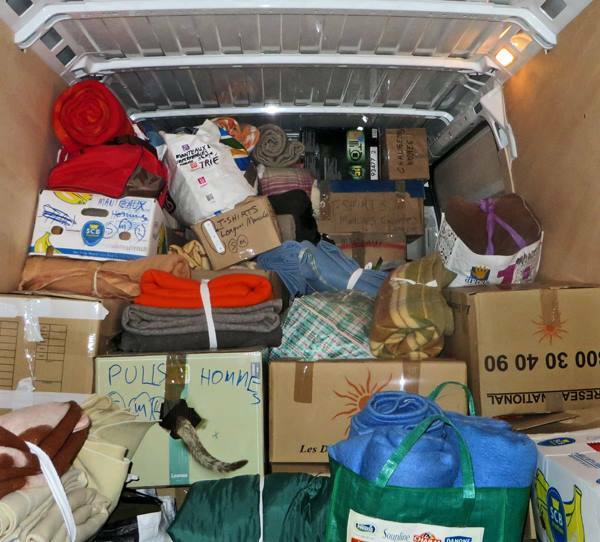 But all of these vitally-needed items for desperate migrants have only been possible through hundreds of kind and carefully chosen donations, also including a big help from the charity we are part of, Languedoc Solidarity with Refugees. They are covering the transport and some of the food costs. We are amazed that people brought bags of clothes etc from as far as Bedarieux, even the Lot, while cheques came from our own region and overseas. We arrive at the vast muddy building-site where we are waved through the steel gate to Caritas’ base. It has been pouring down freezing rain for an hour or more. Long queues of soaked but patient young African guys are seeking medical aid, warm and waterproof clothing and food. They have nothing other than what they are standing up in, but don’t hassle us when we open the van doors. During a pause, waiting for the relay of Caritas helpers to arrive (they are busy preparing food for the crowd), we have a quick look around. There is an orderly chaos of volunteers opening boxes and giving out clothing or shoes even though it’s past their closing time. How we wish we had tried harder to find today’s most-wanted item: a waterproof poncho. Even when the unfortunate onlookers standing by the van see the vast array of food and warm clothes we bring, none of them rushes forward, only pointing at their soaked shoes or clothes in mute appeal. It is very moving- we are seeing a bottomless need. We also see that our weeks of collecting, sorting & packing could be snapped up in moments, with hundreds more still waiting or struggling along the roads toward the frontier and France. With our delivery swiftly unloaded, the volunteers shout and wave their appreciation as they head off for lunch. Somehow we don’t feel like doing ‘refugee tourism’, so head off for our next drop, the food delivery to the community soup-kitchen near Sospel, 30kms away. Eventually finding the community where a group of courageous volunteers are busily cooking a hot lunch for 100 or more, we roll into their slippery turning area to unload. We are impressed by their cheerfulness and devotion to the care of so many unfortunate and hungry young migrants down at Ventimiglia. They soon hand the dozens of big tins and sacks of provisions along a human chain to their store-room, and clearly with great appreciation. Shortly after, I’m trying to manoeuvre the van around again to get out, only to find it is impossible: it will only slither sideways down the hill! With visions of our €1200 damage deposit disappearing, I decide to reverse all the 150metres back down the narrow track to the road again. Nightmare! But, it’s finality achieved with Diana’s excellent guidance. Pause for some deep breaths and a strong cup of tea. The last drop, 2 hours away near St Tropez, is to a large group of former Calais and Paris rough-sleepers, now accommodated at a social housing scheme in a dead-end & out-of-the-way, hostile, holiday town. The first words from Mostafa, our Afghan contact there, are music to our ears : ‘‘Hi. Would you like to drink some chai with us?’’ Oh yes! The warm welcome from these ten Afghans is so moving. Then over tea, a few who speak English tell us a little of their harrowing struggles to migrate overland from their war-torn homeland. One had taken 10 years, with so many rebuffs along the way, locked up, ill-treated yet keeping on. Diana was moved to say: ‘‘No English or French boys could have done all that you did to get here; you are so strong, so determined. You are heroes.’’ Yes. They ask us to share some simple but delicious food with them. How can we refuse? There are 20 others also living in these small rooms of the social housing block, mainly Eritreans. They are all stuck there, with practically no social-work help, language assistance or public transport to get them to the Toulon Prefecture in time to be seen. It is a 3-hour bus-trip away. So, they are all becoming depressed & losing hope. Yet, when these Afghans find I am Australian, they immediately light up and want to know if I play cricket. As it turns out, they are all crazy about cricket! So, after all that they have been through, they only ask us for a cricket bat and ball. I sense that here is the start of a story not yet written: of the Afghan Cricket Club, of how they arrived after one hell of a struggle, to this stifling isolation on the French Riviera; how they will, some of them, win through to gain asylum as Mostafa has; how their enthusiasm for cricket, for life, along with their good nature, intelligence and kindness will eventually get them through to hopefully, an untroubled and quiet life; how they will learn to speak French, working eventually at what gives them pleasure; having family, kids, enjoying the whole patchwork of life. We climb back into the van to their fond farewells, for the last three and a half hours’ drive through the night on an autoroute, now almost deserted. A fairly shattered but satisfied couple get back to Campagnan by 2am, 22 hours after our early wake-up. Bed never looked so good! Will we, would we do it again? Well yes, but not like that. The transport costs too much- €500 that could be better spent on food, warm clothes and so many small, vitally needed items. So, very soon we will be taking a private car or van back to the Alps, this time to Briançon… but not forgetting to drop off some cricket kit to those keen Afghans on the way! What a great story! All those many hours of work collecting and sorting and driving must make you feel it was all worth it. Let’s hope we can get more people engaged in this work and get more needed supplies to all these cold and hungry kids.